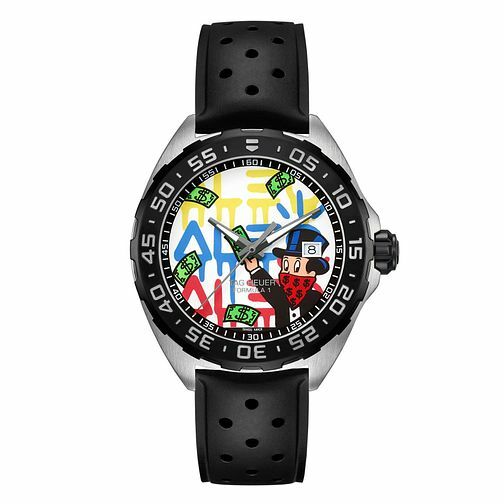 Alec Monopoly, born in NYC as Alec Andon, is best-known for his graffiti art depicting pop culture characters, this collaboration with TAG Heuer for their Formula 1 collection features a colourful and creative dial with a contemporary design. This Swiss-made timepiece also boasts a stainless steel case, with unidirectional turning bezel with tachymeter scale, date display at the 3-o-clock position and is finished in true style with a black rubber strap with dotted detailing. TAG Heuer Formula 1 Alec Monopoly Men's Black Strap Watch is rated 5.0 out of 5 by 1.